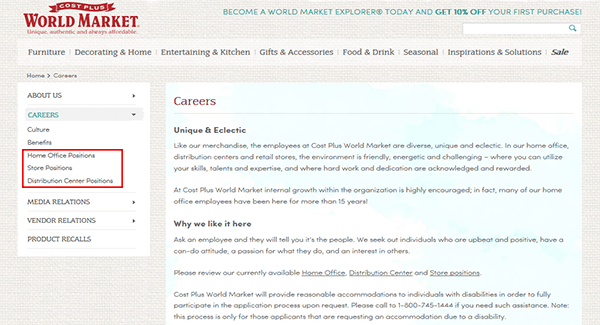 Download the Cost Plus World Market job application via the links provided on this page. Read the guide posted below to learn how to navigate the company’s careers page, search for current openings, and submit an online application. Corporate, distribution center, and in-store positions can all be applied for on the website. About the Company: Cost Plus World Market is an American chain of import retail stores based out of Oakland, California. The company was founded in 1958 and currently has more than 270 locations. Step 2 – Click the link of the specific job type that you’re interested in applying for (e.g. home office, in-store, distribution). The main job search page will load. 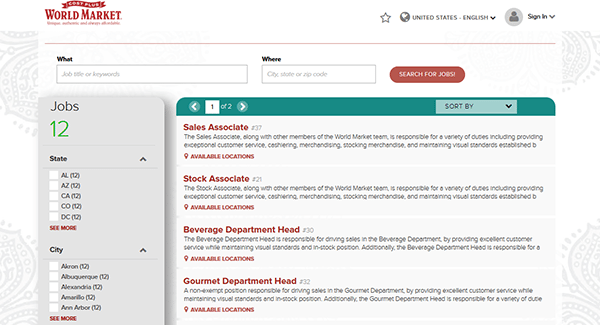 Step 3 – Search the list of current openings by entering a keyword/location into the search form. Results can be filtered via the options on the left side of the page. Step 4 – Click the job title of the position that you want to start the online application process for. Step 5 – Click the “Choose Locations” button. Step 6 – Select the locations you want to apply to and then click the button as shown in the below screenshot. Step 7 – Fill in your email address and then create a password. Step 1 – Download the application by clicking the link/button at the top of the page.